The pasture lands of Kentucky are known for their ‘bluegrass.’ When Europeans starting entering the Kentucky region the Native Indians were the Shawnee in the northern end and the Cherokee in the southern portion, along with the Iroquois who hunted the forest-lands. The early American scouting parties came into Kentucky around 1750 and very soon various treaties were made with the Indians, which later would be broken. Even during the American Revolutionary War, many pioneers headed to the Kentucky lands to resettle. This land was part of Virginia. The Shawnees were not happy with the white settlers and became allies with the British during the war. The Cherokee fought the Americans to keep them out. In looking at Kentucky genealogy, it is seen that the early pioneers were coming from Virginia, Pennsylvania and North Carolina. They fought the wilderness and soon won out for the land. The untamed frontier of Kentucky was introduced to agriculture by the settlers, who brought their slaves with them. They raised tobacco, corn and hemp. Even a battle of the American Revolution was fought in Kentucky, called Battle of Blue Lick. With all the British and Indian violence, there were fewer than 200 settlers in Kentucky in 1776. By the 1780s with a surge in new pioneers to Kentucky, they wanted to break away from Virginia. 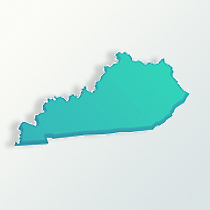 On June 1, 1792, Kentucky was admitted as the 15th state of the new United States with a population of 73,600 people. From 1790 to 1860 the slave population of Kentucky was only about 25 percent of the total population. That number declined in the 1830s when many citizens of Kentucky sold their slaves to planters in states further south. The farms of Kentucky tended to be smaller and large number of slaves were not needed. Also, in the 1840s and 1850s, white families of Kentucky began migrating west to Missouri and Tennessee, even southwest to Texas. Kentucky being a border state during the American Civil War, it did not outlaw slavery, yet did have strong Union ties. Rather, many slaves had escaped from the deep south and gone to Kentucky. About 75% of slaves in Kentucky were freed or escaped to Union lines during the war. Religion was very important to the Kentucky settlers of the 1800s. Most were with the Baptist, Methodist, Christian or Presbyterian churches. After the Civil War, a massive influx of German immigrants settled in Kentucky, especially along the Ohio River, near Louisville is an important note for Kentucky genealogy. A major occupational change came around 1900 when Kentucky went from agriculture to coal mining, principally in the Appalachian region. Other Kentucky families left the state for the Michigan and Illinois regions to work in factories. Industries started to grow in Kentucky in the 1930s and through the 1950s, bringing new people to live in the state. With a state population in 1900 of 2.1 million it grew to 3 million by 1960. In 2009, the state has about 4.3 million citizens. Most have an American cultural background (those with ancestors from the Carolinas, Virginia and Pennsylvania). Next are those of German descent, about 12.7 percent. Those of Irish and English descent make up about 20 percent. The Great Migration from 1910 to 1930 saw many African-Americans move to the industrial cities for jobs. This decreased the African-American population further. Today approximately 7.9 percent of the residents are African-Americans.